The 2017 Audit of Political Engagement has been published by The Hansard Society and offers an in-depth picture of public political engagement after a dramatic year for British politics. A Positive ‘Referendum Effect’ Fails to Materialise. There has been no positive ‘referendum effect’ on public attitudes after the June 2016 EU vote, of the kind witnessed after the Scottish independence referendum in 2014. Claimed interest in (53%) and knowledge (49%) of politics have declined (by four and six percentage points respectively) compared to last year. Satisfaction with the system of governing Britain has barely changed and remains low at 31%. Changes in Political Behaviour? Although the public’s attitudes are proving hard to shift, there are some positive signs of change in political behaviour. After the high turnout in the EU referendum, people’s certainty to vote remains at a high watermark. There are also signs of some improvements in public engagement with Parliament. Just over half the public say they have engaged with Parliament in some way in the previous 12 months – a 10-point increase on last year. Perceptions of Parliament. The public clearly value Parliament, with a substantial majority (73%) believing it is essential to democracy. However, overall satisfaction with the way Parliament works (30%) is now six points lower than when the first Audit was published in 2004. Claimed knowledge of Parliament has declined by seven points from last year to 45%, but remains higher than at the same stage of the political cycle after the 2005 and 2010 elections. 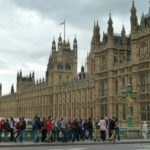 In relation to its core functions, the public think Parliament could do a better job of scrutinising the use of public money, representing ordinary people’s interests, and encouraging public involvement in politics. The EU Referendum Support for more referendums has declined by 15 points. But a clear majority of British people (61%) still think referendums should be used more often for determining important questions. Eighty-eight percent of UKIP supporters support the use of more referendums compared to just 42% of Lib Dems who say the same, while the views of Labour and Conservative supporters are broadly identical (59%). On top of this, just 43% claim to feel knowledgeable about the EU, a rise of just five points since last year’s study.